Samsung Galaxy Note 9: 6.4in screen, 1TB storage, AKG-tuned speakers | What Hi-Fi? Samsung has just announced its next Note big-screen smartphone - and it's big on storage, battery and, indeed, price. With Samsung ‘accidentally’ leaking many of its new Galaxy Note 9’s big features in recent weeks, today’s official launch was, unsurprisingly, more of an anti-climax than perhaps it should have been. Still, that’s no slight on the big-screen smartphone itself, which takes the Galaxy Note line to new heights with improvements in battery, screen, storage and stylus - all of which Samsung's press conference alluded to. As with our initial coverage of the excellent Galaxy Note 8 last year, we’ll start big - only this time not with screen size but with storage capacity. The entry-level edition of the Note 9 has 128GB onboard, while the other variant boasts a massive 512GB. As the built-in storage can be expanded by up to 512GB via microSD card, it means the Note 9 is capable of over 1TB of storage - which should delight even the happiest of snappers and most determined app hoarders. While the Note 8's AMOLED display measured 6.3in, the Note 9's is slightly bigger at 6.4in, making it the biggest-ever Note screen. The Note 9 comes toting an all-new S-pen stylus, which has a finer tip, increased sensitivity and, for the first time, integrated Bluetooth. And while this means it now requires a very tiny battery (which takes a minute to fully charge in the phone, providing an hour of use), it expands the pen’s usefulness beyond smudge-free navigation of the phone. It can now be used as a remote control - you can click it to switch through Powerpoint slides or take a selfie without your arms getting in the way. Speaking of battery, the Note 9’s is up almost 20 per cent from the Note 8’s at 4000 mAh. It's the biggest there has been in a Samsung Galaxy phone. As well as an 'intelligent camera' that notifies the snapper when it detects image blur or closed eyes in the frame, the Note 9 has AKG-tuned speakers - just like the Galaxy Tab S4 Samsung announced last week. Another feature the Note 9 shares with the brand's latest tablet (and its predecessor) is DeX compatibility, which allows the phone to connect to an external monitor, keyboard or mouse for a more desktop-like experience, giving users the option to use either an Android interface or a desktop equivalent. 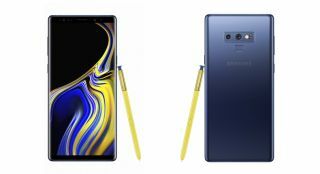 Available in ocean blue, midnight black, lavendar or metallic copper, the Samsung Galaxy Note 9 is due on sale 24th August - two weeks earlier than the Note 8 last year. It would seem Samsung is looking to give the Note 9 every opportunity to sell, in light of reportedly weaker-than-expected sales of its Galaxy S9 and S9+ handsets. The Note 9 looks to be one of the most expensive smartphones on sale, priced £899 for the 128GB model and £1,099 for the 512GB variant - so 'every opportunity' is almost certainly what it'll require. Needless to say we look forward to seeing whether the Galaxy Note 9’s performance justifies the price, first in a hands-on review tomorrow (watch this space) and then in a full review shortly after.